Mac Bulk SMS Software for Android Mobile Phones facilitates to send global text messages among mass audience. SMS software sends multiple text messages from computer system using Android Mobile Phones without any internet gateway. Group messaging software provides facility to send instant text messages to promote business products and increase business sales. Bulk text messaging software facilitates users to communicate with friends, relatives, business clients or customers without internet gateway. PC to mobile messaging software delivers instant text alerts to multiple contact number and save sent text message details for future usage. 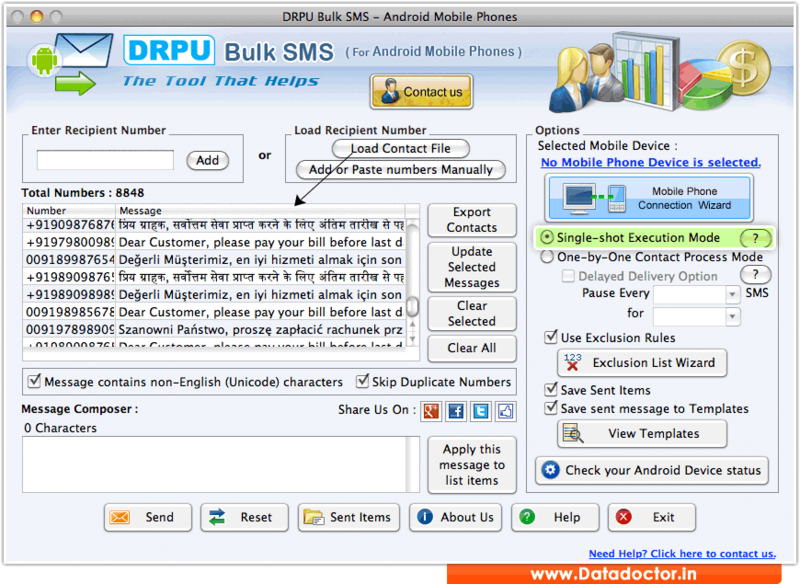 » Mac bulk SMS software facilitates user to send instant messages from PC to any other mobile phone. » Group SMS software delivers text alerts from PC via connecting android mobile phone. » Software automatically skips duplicate contact number during message sending process. » Android message sending program offers delayed delivery feature to manage bulk sms broadcasting. » Mac group text messaging program facilitates to send standard SMS or notifications as per user choice. » No internet connection is required to send worldwide global SMS from PC.